Danby Pipe Renovation/Lining - Services - L.J. KEEFE CO. The Danby Pipe Renovation System (Danby) is a trenchless construction method to renovate large diameter structures and structural pipes. Danby provides an improved load carrying capacity and a significantly longer useful life to the pipe system at a reduced cost to conventional pipe reconstruction. Danby has been installed in pipes ranging in inside diameter from 36" to 144" and larger. The reinforced steel bolster system (anchors) make Danby compatible with a variety of host structure materials such as brick, steel, corrugated metal, concrete pipe, etc. Danby can be supplied in either coils or pre-cut strips which allows the liner to conform to practically any shape. The process requires manned entry into the host structure to construct a new composite structure within the host structure, which is commonly referred to as a 'Cured-in-Place Pipe' (CIPP) Lining Method.' Typically, a reinforced steel bolster system is installed on the interior of the host structure to provide a uniform annular space for the grout around the PVC strip liner. A 12" wide PVC spiral wound former strip, which has a smooth inner surface and a ribbed outer surface, is installed within the host pipe. The edge configuration of the liner strip and joiner strips allows for mechanical locking of the adjacent strips to form a complete liner system. 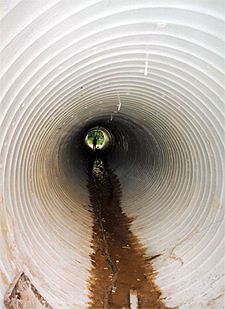 The annular space between the inside diameter of the host pipe and the outside diameter of the PVC liner is then filled with cementitious grout. ASTM F1698-02 - Standard Practice for Installation of Poly (Vinyl Chloride) (PVC) Profile Strip Liner and Cementitious Grout for Rehabilitation of Existing Man-Entry Sewers and Conduits. ASTM F1735-02 (Re-approved 2008) - Standard Specification for Poly 9Vinyl Chloride) (PVC) Profile Strip for PVC Liners for Rehabilitation of Existing Man-Entry Sewers and Conduits.